Côte-d'Or (literally, "Slope of Gold", "Golden Slope") is a department in the eastern part of France. 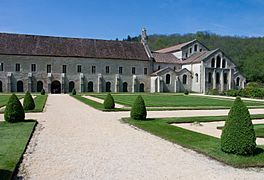 It is one of the 83 first French departments made during the French revolution and one of the eight departments of the Bourgogne-Franche-Comté region. 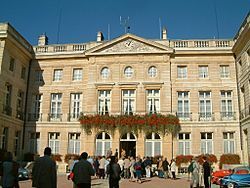 Its prefecture (capital) is the city of Dijon. The inhabitants of the department are called Costaloriens (women:Costaloriennes) or Côte-d'Oriens (women:Côte d'Oriennes). Côte-d'Or is one of the original 83 departments created during the French Revolution on 4 March 1790. 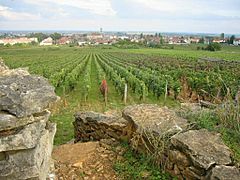 It was formed from part of the old province of Burgundy. It was divided in seven districts: Arnay-le-Duc, Beaune, Châtillon-sur-Seine, Dijon, Is-sur-Tille, Saint-Jean-de-Losne and Semur-en-Auxois. In 1800, with the creation of the arrondissements in France, the seven districts were changed into four arrondissements: Dijon, Beaune, Châtillon-sur-Seine and Semur-en-Auxois. 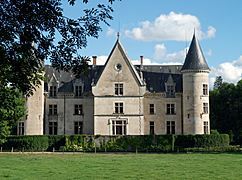 In 1926, the arrondissement of Montbard was made with the arrondissements of Châtillon-sur-Seine and Semur-en-Auxois. Morey-Saint-Denis in autumn. The department is named after this kind of landscape. Côte-d'Or is the only French department who was not named after a geographical feature: a river, a mountain, and so on. The name was chosen by Charles-André-Rémy Arnoult, member of the National Constituent Assembly of 1789, who suggested the name, inspired by the golden hue that took the vineyards of the region in the autumn. The French word côte means, in this case, a slope that geologists usually name with the Spanish word cuesta. The department has an area of 8,763.2 km2 (3,383 sq mi). The highest point of the department is Mont de Gien (), 721 m (2,365 ft) high; it is in the commune Ménessaire. The lowest point of the department, 174 m (571 ft) high, is where the river Saône leaves the department, in the commune Chivres. A chain of hills called the Plateau de Langres runs from north-east to south-west through the department to the north of Dijon and continues south-westwards as the Côte d'Or escarpment, which takes its name from that of the department (without the hyphen). 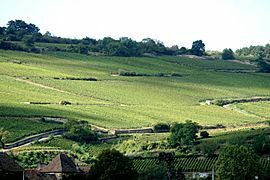 It is the south-east facing slope of this escarpment which is the site of the celebrated Burgundy vineyards. To the south-east of the plateau and escarpment, the department lies in the broad valley of the middle section of the river Saône. The Seine, with its source in the southern end of the Plateau de Langres, in the commune Source-Seine. The Aube, right tributary of the Seine. The Armançon and the Serein, tributaries of the Yonne which is a left tributary of the Seine. The Saône, an important tributary of the Rhône. It flows through several communes of the Côte-d'Or department and some of the tributaries are Vingeanne, Tille, Bèze and Ouche. The Arroux is a right tributary of the Loire. The Köppen climate classification type for the climate at Dijon is an "Oceanic climate" (also known as Maritime Temperate climate) and of the subtype "Cfb". 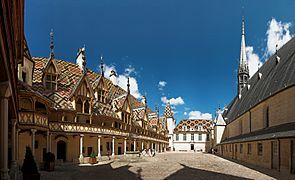 The average temperature for the year in Dijon is 10.6 °C (51.1 °F). The warmest month, on average, is July with an average temperature of 19.4 °C (66.9 °F). The coolest month, on average is January, with an average temperature of 1.7 °C (35.1 °F). The average amount of precipitation for the year in Dijon is 698.5 mm (27.50 in). The month with the most precipitation on average is October with 73.7 mm (2.90 in) of precipitation. The month with the least precipitation on average is February with an average of 40.6 mm (1.60 in). In the Plateau de Langres, winters are long and cold with frequent frosts. The department is managed by the General Council of Côte-d'Or in Dijon. Côte-d'Or is part of the region of Bourgogne-Franche-Comté. There are 3 arrondissements (districts), 23 cantons and 705 communes (municipalities) in Côte-d'Or. Côte d'Or has a population, in 2013, of 529,761, for a population density of 60.5 inhabitants/km2. The arrondissement of Dijon, with 371,239 inhabitants, is by far the one with more inhabitants. 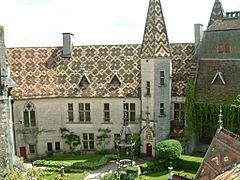 The other two, Beaune and Montbard, have respectively 97,474 and 61,048 inhabitants. Côte-d'Or Facts for Kids. Kiddle Encyclopedia.